With a little creativity and effort, we all can play a role in increasing recycling away from home. The challenge. It’s not always easy to improve a recycling program. I worked with a school that had recycling, but the recycling bins were contaminated with garbage, and the garbage cans were full of plastic bottles and aluminum cans. What’s more, it looked like the recycling bins were not being emptied regularly. I quickly learned that the school couldn’t just put bins out and expect people to use them. We had two big challenges: one was getting the waste contract changed to meet the full recycling needs of the school; the other was training everyone needed to make the program run. After several school assemblies, staff meetings, and a small construction project to improve the bins, our recycle team succeeded. We improved the system, and the school was able to reduce the size of its garbage dumpster and increase the size of the recycling dumpster. This saved them money! Minnesota law requires public entities to have containers for at least three recyclable materials and to transfer all materials to a recycler. State law requires waste haulers to add taxes to the waste bills, but recycling and composting are exempt. Most of what schools throw away is not garbage. More than 75% of school waste could be diverted to organics composting and recycling. This information helped me gain support from decision-makers and others. Get started in your own school, work-place, or faith community. Recycling gurus pooled their knowledge and resources in a handy Recycling Toolkit for Schools. The information can be easily used at your work place or faith community, too. There are case studies, videos, and downloadable resources, like waste-tracking sheets. While getting new bins and improving signage can go a long way towards increasing recycling rates, using this more systematic approach can lead to more sustained success. It only takes one student, parent, staff person, or member to start the improvement process. With the clear examples and resources available in the toolkit, you can start building your recycling team. If you start recycling in your school, work, or faith community, tell us your story! Email livinggreen365.pca@state.mn.us. An important consideration is what bins and labels to use. 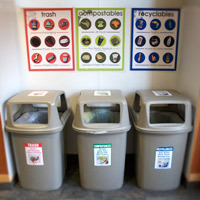 Always use established and proven "best practices" for bins and labels to increase participation, decrease contamination, and accelerate your education efforts. Contact your local county solid waste office to see if they have a recycling bin program or can help in other ways. If you live in Ramsey County, consider applying for a grant to public K-12 schools to support the purchase of recycling bins. For more information and an application, contact Joel Andersen at 651.266.1178. Ask your recycling hauler if they provide bins or could help in other ways. Talk to a bottling and soft drink vendor to see if they could provide collection bins or boxes as part of their contract to sell products. Apply for a competitive, national Coca-Cola Company and Keep America Beautiful bin grant. Local governments and other public entitites can become a member of the state's Cooperative Purchasing Venture, allowing for purchase of containers at bulk rates. Consider purchasing the Recycling Association of Minnesota bottle-shaped bins. If money is tight, sturdy cardboard boxes can can be a viable alternative. Design and build your own containers as a class or volunteer project. Free, standardized labels will be available later this summer from the Recycling Association of Minnesota. Contact your local county solid waste office for labels specific to your county. Hennepin County has some good examples. Make your own labels. Clip art for labels can be downloaded from the Recycle More Minnesota Media Toolkit. Dirt-o-rama is a summer exhibit at the Minnesota Landscape Arboretum. Get dirty with hands-on activities for kids, learn to compost in your backyard, or enjoy the dirt art (really, it's cool!). June 2-October 14 (Chaska). The Institute for Agriculture and Trade Policy (IATP) is hosting a Bike and Bite event. It is a food-centered community bike event that involves biking between stops to taste delicious local foods, August 18, 10 a.m., IATP office (Minneapolis). Visit the Eco Experience at the Minnesota State Fair to discover green options. The exhibit has hands-on exhibits and experts on topics important to you, like home improvement, landscaping, renewable energy, and recycling. You'll find basic info and cutting edge technologies. There is tons of stuff for kids and families, too. Consider volunteering in one of the exhibits as a way to spend a fun day at the fair, August 23-September 3, 9 a.m.-9 p.m., Minnesota State Fair Grounds (St. Paul). Save on Solar workshops are being offered in many Minnesota cities this summer. The Minnesota Renewable Energy Society conducts these workshops to highlight their Solar Hot Water/Air Heat Bulk Purchase Program, Make Mine Solar. Participants will learn the basics of energy efficiency, solar hot water and solar air heat technology, how the bulk purchase program works, rebates, incentives and financing. Visit the MRES website for dates and locations.